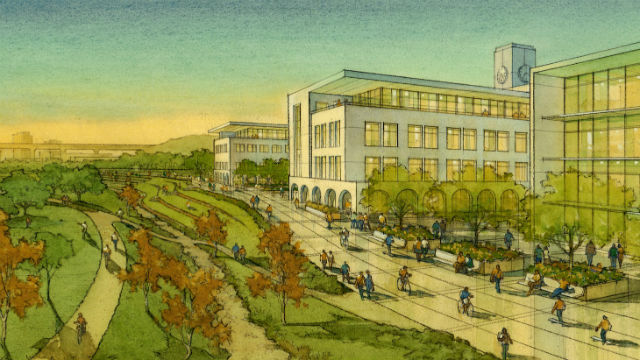 San Diego State University announced Wednesday a plan to redirect Murphy Canyon Creek’s flow as part of its redevelopment plan in Mission Valley. Mission Valley is a floodplain with occasional flooding from the San Diego River reaching into the parking lot at SDCCU Stadium when it rains. The proposal would divert the creek, which converges with the river near the stadium, to a more winding course with less potential for flooding. Builders would also raise the proposed project and its adjoining neighborhood above the floodplain using crushed concrete recycled from the old stadium. Tennis courts, baseball diamonds, soccer fields and open green space would be built at a lower elevation than the raised project site, providing an undeveloped buffer zone for when the river overflows from rainfall. The SDSU West ballot initiative, meanwhile, has received public support from Councilwomen Lorie Zapf and Barbara Bry in recent weeks, as well as the Lincoln Club, Sierra Club and the California State University Board of Trustees. The redevelopment of the current SDCCU Stadium site would include a new 35,000-seat stadium for Aztecs football and soccer, hotels, retail buildings, an academic campus and the river park. Also on the ballot is a competing initiative for SoccerCity, which also proposes mixed-use spaces, as well as a 23,500-seat professional soccer stadium that could be expanded to accommodate Aztecs football.